"A FABLE FOR FRIDAY" is a fast fiction that's all about the genesis of fun and the mythological origins of the weekend. 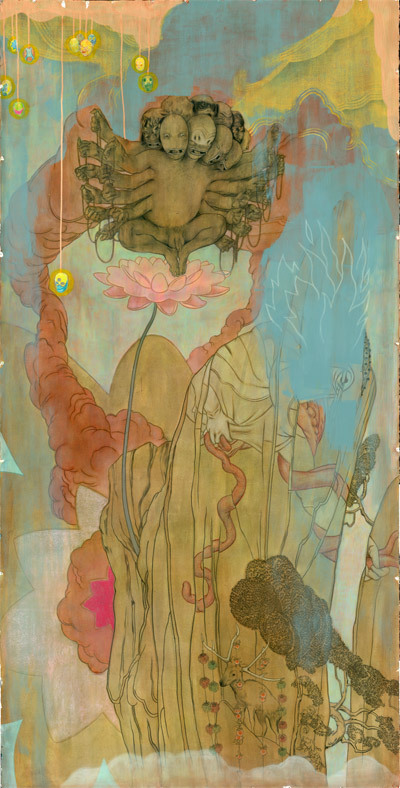 Based on a breath-takingly bizarre image from James Jean , this story rewrites a fable or two as well as a couple systems of theology, all within the span of a couple hundred words. In the beginning the world was awash in everything. Matter was mixed into a chaos of formations and time itself was a tangled knot of now and before and when. Within this confusion the earliest sources of souls, both great and small, took their home. Mattarava - who was himself a conglomeration of several future deities as well as a group of professional wrestlers from Mexico and perhaps a couple future unknowns - hovered above his lotus deciding the fate of a series of strings that had fallen into his possession. "Let us take these and make veins that will be tie the guts of fragile creatures together," said one of the heads who would himself go on to find fame on his own within Zoroastrianism. "Let us take this and make tiny strands of life that will encode the secrets of sentient existence," said another head that would someday win the championship belt in professional wrestling. "Let us first take a break," said a small god that would go on to be the spirit of a homeless man on the streets of Chicago. "What is that ?" asked several heads in unison. "Close your eyes and you will see." And within that simple moment of discovery the first weekend was born.